The WLGO is coming May 1st!! 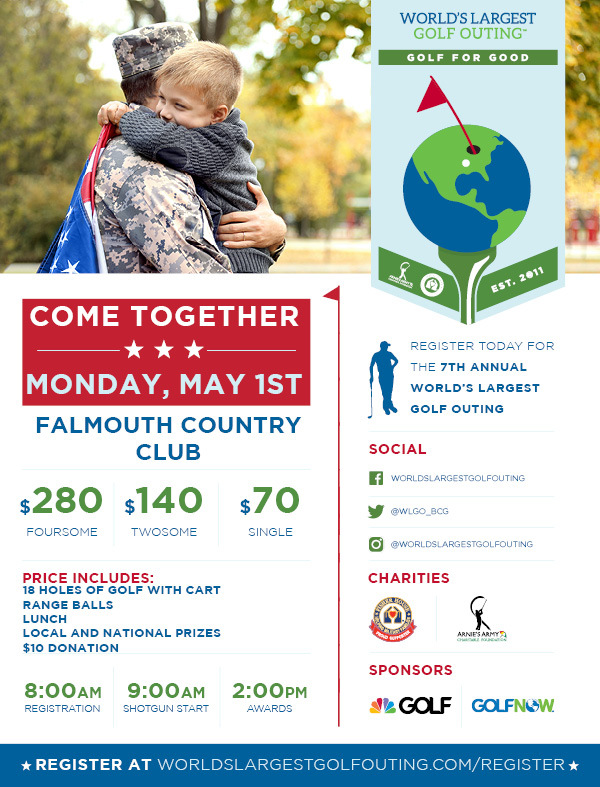 The World's Largest Golf Outing (WLGO) is coming to Falmouth Country Club a little earlier this year. Mark your calendars for May 1st for a 9:00am shotgun!! The World’s Largest Golf Outing™ (WLGO) is the single largest charitable golf event held on one day that makes a significant impact in the lives of those who need it most - our nation's veterans - and communities around the country. This year, WLGO will benefit two sponsors for the first time in the event's history. The two sponsors are Fisher House Foundation, which is best known for a network of comfort homes where military and veterans’ families can stay at no cost while a loved one is receiving treatment, and Arnie's Army, an Arnold Palmer inspired charity which provides financial support to institutions and organizations that help children, youth, families, the environment, and the communities in which we live. We look forward to seeing you on May 1st as we raise thousands of dollars for two great causes! !